Author: Anthony Traill †. Edited by: Hirosi Nakagawa, Anderson M. Chebanne. With a preface by: Jill Traill. Series edited by: Rainer Voßen. 8 pp. Roman, 318 pp. !Xóõ is the last member of the family of Southern Bushman languages. It is spoken in a number of varieties in southwestern Botswana, in the Ghanzi and Kgalagadi Districts and in the Aminuis Reserve in Namibia (Traill 1985). 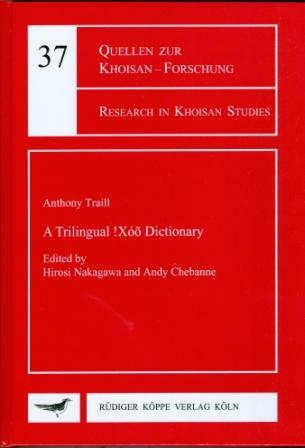 Anthony Traill (1939-2007) first went to work with the !Xóõ in 1969 and published a bilingual dictionary in 1994. The present trilingual dictionary is one of his unfinished works, which finally could be completed. It has its origins in a 1,300-word database which was assembled a number of years ago and only contained examples of words necessary to conduct a linguistic analysis of phonetic, phonological and relevant syntactic forms and also included the words of the 200 word Swadesh list for comparative studies. During the last years of his life, Traill made a concerted effort to record as many lexical items as possible, due to the realization that the language was severely threatened. Furthermore, no generally available lexical material on !Xóõ existed, and there was also the need to extend the coverage of the languages' word stock in order to explore phonetic and phonological phenomena as completely as possible. This also explains the inclusion of plant names, bird names, pan names and personal names, which are not normally included in a dictionary. Concerning the specification of the contents, the author pursued two goals: the first was that it should include every word that could be found in all linguistic literature on Khoisan languages, the second that it should include every native word or concept used in the anthropological literature on the Khoi or San. The dictionary does not pretend to be complete but it does contain a systematic attempt to reflect as much as possible of the lexical and conceptual content of a unique culture. The English-!Xóõ part is not a reverse version of the !Xóõ-English part. The latter is far more extensive in its lexical coverage and it contains grammatical information, illustrative examples and cross-referencing. The English-!Xóõ and Setswana-!Xóõ sections are included to facilitate access to the other part, and it does not contain a careful listing of all the English or Setswana glosses for !Xóõ words nor of the variety of grammatically conditioned versions of a word.